Comic Book Marathon Bun Toons! YAY! | Ty Templeton's ART LAND!! Comic Book Marathon Bun Toons! YAY! And thus, Canadian Splendor is born. Right now, in Toronto, my wife Keiren is at the COMIC BOOK LOUNGE AND GALLERY (387a College Street, at Clinton) presiding over yet another wildly popular COMIC BOOK MARATHON, for dozens and dozens of local creators to show off their skills and stamina. When the art and stories come in from this latest one, we’ll put some of it up here and at the school’s website and all over the darn ‘net, don’t worry. But the last marathon was the first time my wife sat down and participated, rather than just running it. She produced about ten or twelve scripts for short autobiographical comic stories, most accompanied with simple artwork. There was no talking her into running the strips with her original art, but she was willing to let me finish up one and put it up here. I started with the one you just read because it was the shortest, but I’m going to do a few more over the next few months, just you wait. I loved them. I didn’t change anything, I just inked her drawings with a bold line and some minor details. There’s one about a road trip Keiren took in high school with her best friend that I will be doing finishes over her layouts for in the next few weeks. I couldn’t do it today because it’s five pages long and I didn’t have that much time…but it’s great! Some are funny, some are poignant, some are really personal. Who knew I was married to Canada’s Harvey Pekar? I’m wondering what she’ll be creating and bring back with her today! If you’re in Toronto, head over to College and Clinton, bring a pencil and a sandwich, and see what new majestic tale Kerien and the rest of the cartooning legions of the Big Smoke are spinning now. 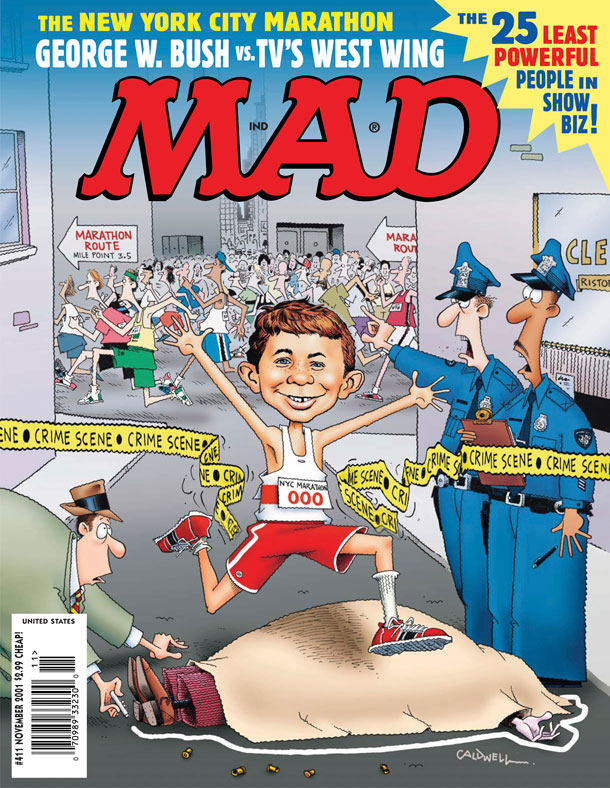 The first person to tell me Mad Magazine isn’t a comic book gets punched in the throat. For last week’s MAN OF STEEL based Bun Toon, click the title above. For some of the work produced at the big 24 hour marathon in January, click here. This entry was posted in bun toons, Bunny Funnies, True Life Tales, Ty Toons and tagged Comic Book Lounge and Gallery, Comic Book Marathon, Harvey Pekar, Keiren, Keiren Smith. Bookmark the permalink. Yeah, pretty cool, eh? I believe you were present at the marathon at which this was created, no? It was the one at the school just a couple of weeks ago. (I’m not sure how many people Keiren let see the work there…) My favourite thing about this piece was the way that narrative is always waiting for “someone” to be there, but there’s absolutely no one else in this world. No pedestrians, no other cars, not even Keiren’s own hand reaching for door knobs, etc. I thought that gave the story the most haunting and creepy element…this empty universe in which the fear is the presence of another. Wait until you guys see the “road trip” story. Living like this (always checking) is part of my life now since someone tried to kill me early this fall. But… life is more than this. These are just these cautious moments, selected and highlighted. Life isn’t only this. It’s sprinkled with this, but it doesn’t consist of only this. Once I’m inside and can feel safe for a while, that relaxation is worth so much. Thanks Kieren and Ty for this piece. I hope the short comic didn’t suggest it was the totality of life. Instead, it was a window into the world of people who have these thoughts…as my wife Keiren often does. I thought the images were worth sharing.